Jarid Vollmer started off the season by shattering the national record at the Texas Motorplex in April by running a 8.51et at 160.52mph. Vollmer scored wins at the next 3 events he attended and actually had the National Points chase secured by the time he headed to World Finals. 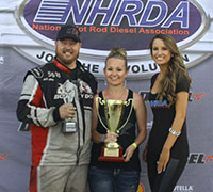 Jared went on to win the Pro Street World finals and the Nationals Championship for the 4th straight year.